As a kid, I was hooked on the Chicago Cubs. We lived in a neighborhood not far from Wrigley Field. During the summer, a couple of Cubs players occasionally rented an apartment in our building. From my bedroom window, and with the help of binoculars, I could see the famous ‘W” flag (for “win.”) When I was old enough, I’d ride my bike outside the ballpark with a radio and listen for the cheers. Even when all the Cubs had was some hitting and a great relief pitcher named Bruce Sutter, I was in until the end of the season. Or when they had a brooding home run hitter named Dave Kingman (who once dumped a bucket of ice water on a sportswriter). Or when they finished last or next-to-last for five straight seasons. Or when they made a run in 1984 with a bunch of solid players and a young future Hall of Famer named Ryne Sandberg. Now, getting set to watch the Cubs take on the San Francisco Giants at AT&T Park tonight, I find myself trying to hold onto to the most unusual feeling that I’ve ever had as a Cubs fan: Confidence. Sure, it’s shaken a bit after the Cubs dropped a heartbreaking five-hour-long Game 3 last night that would have knocked out San Francisco at home. Our best hard-throwing relief pitcher (brought in this season for these very situations) blew a save. The Cubs rallied late, tied the game, sending it into extra innings and then the Giants – who have won a mind-blowing 10 consecutive playoff elimination games in recent years – won it in the 13th inning. ESPN’s confidence meter of the Cubs winning the World Series has changed a bit, too. But still, I remain pretty confident the Cubs can beat the Giants as well as other teams in their path and actually win the World Series for the first time in 108 years. This longtime emotional dissonance — between optimism and excitement, pessimism and resignation — finally caught up with me and my young sons. For a Cubs fan, it’s a very different feeling. I’ve been optimistic in past playoffs – especially in 2003 — but always more anxious, a tad jittery, maybe even a bit superstitious against my better judgment. Believe me, it’s not cockiness. I’m highly aware the Cubs can be knocked off, including by the always-tough Giants. But this Cubs team has more weapons, more depth, and a sense of assuredness about itself that I simply can’t remember seeing from the time I was a kid. For some Cubs fans, every season renews their love affair with the team, with Wrigley Field itself. I had many seasons like that, too. But truth be told, I can’t say it’s always been the case for me. Some years are bittersweet. Then there are the years that are just bitter. Some years, you make the emotional investment in a star carrying the team with little talent. That Sammy Sosa steroids home-run era was crazy fun — until medical reality set in. And yes, I start off each season intrigued, sometimes hopeful. But as the losses pile up (more than 100 just four years ago as they were rebuilding), there are summers where my interest wanes by mid-August. Or early September. Or even mid-July. It’s easier to drift away for the latter part of the season when you’re not living in Chicago. I remember telling myself after one particularly brutal year: It’s simply not right to pass this kind of thing on to your children. Sure, they can choose the Cubs if they wish. But there’s no good reason to lead them to near-certain heartbreak year after year. Offer them an alternative: Hey, we live in DC and the Nationals are making the playoffs periodically. Then, if they are drawn to the Cubs, you’ll know it’s their choice. For a while, I couldn’t help but recall the unimaginable collapse against the Florida Marlins in 2003 — when the Cubs were just a win away from the World Series, had the lead until late in the game at the Friendly Confines and should have made it. That took a little bit of the spirit out of me — and I eventually thought, No, I need to spare the kids from this. I didn’t exactly give up on the Cubs personally. But a sense of perennial pessimism crept in. When I watched a documentary about the history of the Cubs, I remember thinking, that old guy who’s waiting for them to go to the Series? He’ll die before they get there. But as General Manager Theo Epstein, Manager Joe Maddon and a cast of exciting young players have electrified the majors the past couple of years, I couldn’t resist pulling our sons into it too. 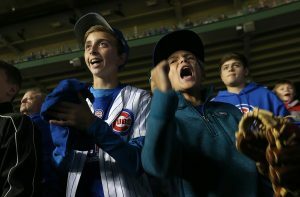 Over the years, there’s been so much talk about whether the Cubs and their fans — like the Boston Red Sox before them — will lose a sense of their identity as the “lovable loser” should they win it all. That’s never worried me. I don’t actually believe they’re cursed by a billy goat, a black cat or a fan named Steve Bartman. I don’t actually believe they’re cursed by a billy goat, a black cat or a fan named Steve Bartman. Yes, they’ve been cursed in the past — but cursed by bad management, stingy owners, too little talent, a broken farm system… or, as their former broadcaster Steve Stone noted, by playing only daytime games in the summer heat at Wrigley for too many years. I don’t believe in jinxes. And yet even as I write this, just the mere fact that I’m doing so makes me wonder if I’m somehow altering the karma. But this season feels different. They’ve led from start to finish. They’re loose and relaxed. They have solid pitching, strong hitting and great defense. They have a manager who’s calm, cool and collected — and who’s tried to take the edge off all season. And they have Epstein, who got the Red Sox to the title.